1. 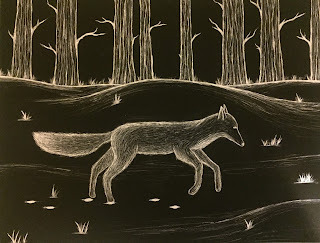 For my scratch board piece I decided to draw my favorite animal, a fox. 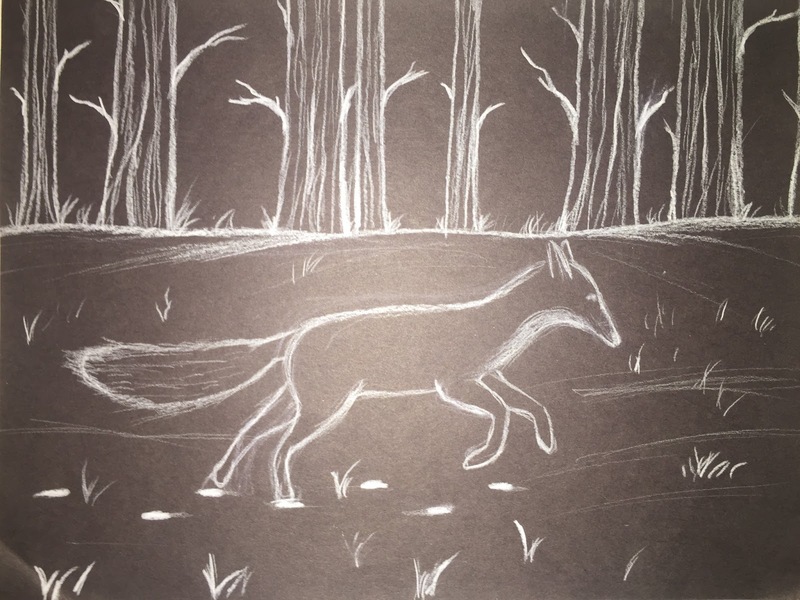 In this scene the fox is galloping through the snow, which creates the movement, with trees visible in the background. I felt that snow would be a lot less overwhelming then the texture of a bunch of grass around the fox. 2. 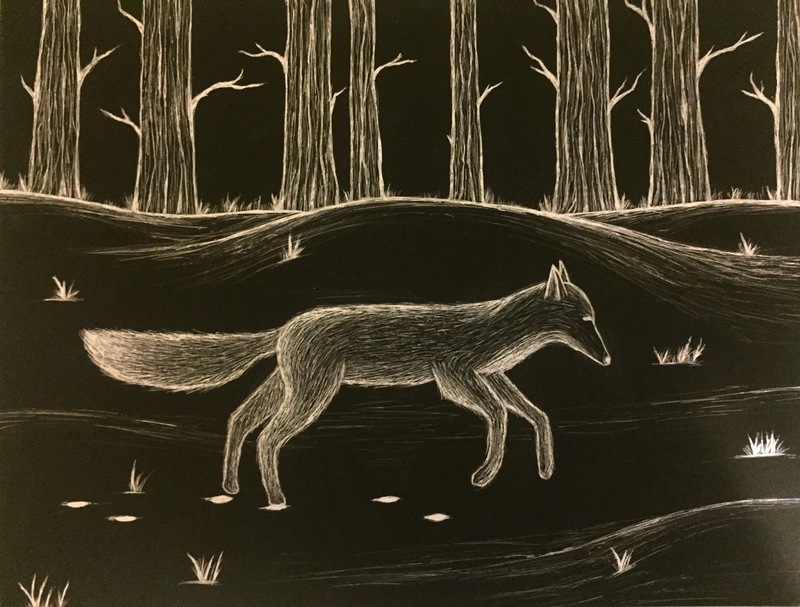 The two major things in the picture are the fox and the background trees and that's where I had to make the texture count. For the fox I layered fur adding more on some of the edges and at the tail to emphasize a highlight and create depth. And as for the trees I made a few thick marks in the wood on each and then filled them in with non-straight lines to give the illusion of a wood grain. 3. To make the piece look balanced I put an object with a lot of texture in the front and some in the background. The fox catches your eye first and then it transitions to the trees. I didn't do a dramatic middle ground around the fox because I didn't want to take away from the fox and have too much texture going on. 4. 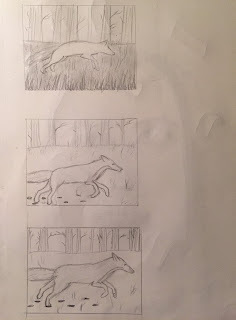 Movement is implied through the fox. I drew the legs to look like they were galloping vs. standing still. You can also tell the fox has been moving because of the foot prints trailing behind in the snow. 5. I feel like the piece could be improved by adding more to the ground around the fox and maybe a different landscape and then putting something in the sky behind the trees. I was a little afraid to go big and create something with a lot of texture because I tend to do artwork that is very light and doesn't have a ton of contrast. If I had branched out and added more objects with texture I think the piece could've turned out a lot better. 6. Most of the shading is within the fox. 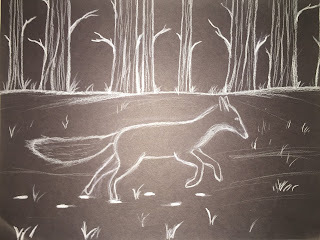 I shaded the body and legs and tail according to their shapes keeping mind where the highlights and shadows would hit. I shaded more where there's most hair/longer hair to make it look more layered too. The slopes of snow are also shaded to create the shape and it fades out as it hits flat land.